See lot 36 in this sale for the monkey-and-bee motif. The horse adds the idea of immediacy (mashang, ‘on a horse’; i.e., ‘right away’). This example qualifies as a silhouette in the sense that it is an extensively edited thin plane of darker material wrapped evenly round three of the four sides. The plane of colour here is radically curved, a rather rare exception to the rule. 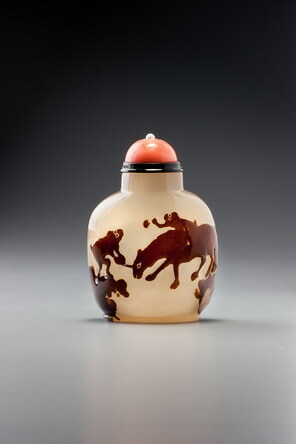 To take full advantage of the material, the artist was encouraged to make a much fatter silhouette bottle than usual. The only incising used to create the design here, as opposed to editing away unnecessary colour, provides the eyes of the two monkeys and the horse. It is achieved quite simply by providing two circles for each of the monkeys’ eyes and a more carefully eye-shaped incision for the horse’s single visible one, giving the monkeys the appearance of wearing spectacles, which is quite common for the type. Because of this, they look distinctly bemused, which adds a certain charm to the design. The clarity, stark contrast, and simple delineation of this silhouette design qualifies it as one of the more impressive in the medium, and the unusual curving plane of the natural markings in the stone, used to full imaginative genius by the artist, ranks it still higher. Another silhouette chalcedony with a monkey and horse in a landscape, where the eyes are done in an identical way, is illustrated in Friedman 1990, no. 48. The collar here is of vinyl. The vinyl collar was a Hong Kong invention of the 1960s, when local dealers imaginatively re-used old gramophone records as collars and then progressed to making collars directly from vinyl. At first they were used as a simple emphasis between bottle and stopper to stand for the usually more complex but by then often difficult to find old bronze, gilt-bronze, or silver collars, although they also stood for earlier glass and other collars that were simple discs. Gradually their use evolved to doubling up the collar to give greater emphasis, and finally to varying their diameter so that the shape of many earlier metal collars was also reflected, as here. Y. F. Yang, the doyen of Hong Kong’s snuff-bottle dealers and one of the most creative and highly respected, was largely responsible for popularizing both of these developments. In more recent years, as snuff-bottle values have increased, it has become worthwhile to recreate, regardless of the expense, the silver and gilt metal collars of old bottles, and these are gradually replacing the vinyl alternatives, for the obvious reason that they are more impressive and closer to the original concept. Here, three vinyl discs have been used to match an original form in metal, and they work successfully as a foil for the dark natural markings in the stone, but as a rule, the more recent metal equivalents are more successful visually. These modern equivalents were only just beginning to be made when the Bloch Collection was re-stoppered for photography in 1993 and not available in large enough numbers to cope with a collection of this size. Stoppers, when not original, can be changed as often as collectors wish, and it is part of the joy of collecting to do so. In future many bottles will acquire different stoppers in an ongoing refinement based upon availability and personal taste. In decades to come, when bottles have reached inevitably still higher values, the cost of having stoppers specifically made by jewellers will not be prohibitive and any bottle can, in theory, be given a perfect stopper commensurate with ancient style. 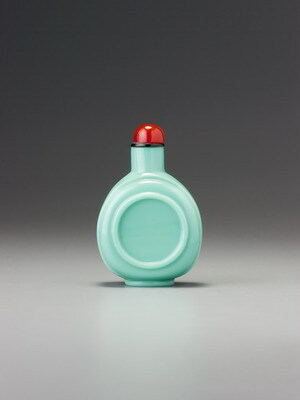 A stopper, if not an original, is like the frame on a painting. It is important, but seldom fixed for eternity as an integral part of the work of art.